The VFL flag, but still! The Footscray faithful turned out in force yesterday for the 2014 VFL Grand Final at Etihad between Footscray and the Box Hill Hawks. The crowd of 23, 816 (I think) was the largest for a VFL game in 25 years; it was 9,000 greater than last year's Grand Final between the Box Hill Hawks and Geelong, and I would estimate that 90% of the crowd were there for the Bulldogs. 1. 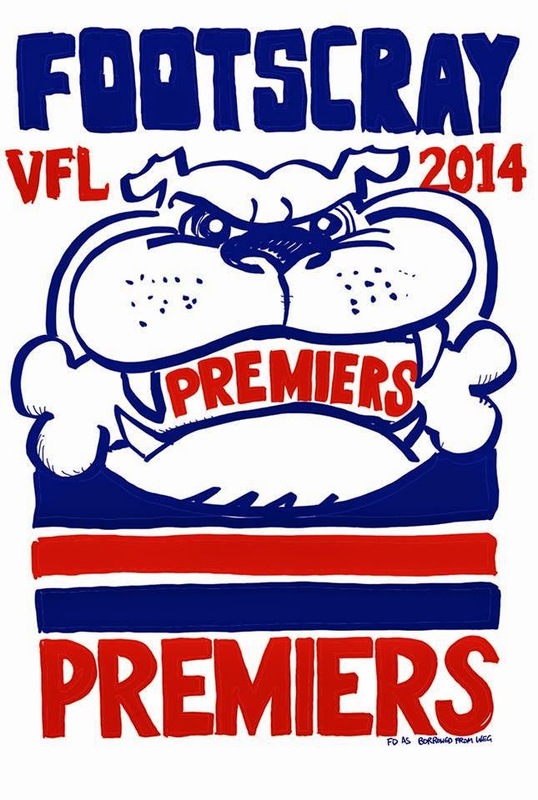 This was Footscray's first year in the VFL competition with a stand-alone side. That's right, it was a first year team. All year, they had emphasised that the Footscray VFL side was there to promote the development of the AFL side, a place to play the youngsters and train them up; winning games was secondary. But we won 15 out of our last 16 games, finished the season second on the ladder, and now we are VFL Premiers! What an extraordinary achievement. 3. It was a great game of football. The Hawks were three goals up at one stage; the lead kept changing hands. But the final quarter was a blinder. The Hawks were hamstrung by injuries to a couple of players (no subs at VFL!) and Cyril Rioli, their superstar, was pulled off at three quarter time in case Hawthorn want to play him next week in the Really Big Final. And the Footscray boys went beserk! We kicked three goals in three minutes to draw level, then three more to seal the victory. (Liam Jones, we never doubted you!) The crowd were on their feet, pushing Footscray home by sheer force of will and rowdy noise. 4. At the end of the game, the crowd spilled onto the ground. It's safe to say that they were a pretty happy bunch. It was wonderful to part of such a big, joyful mass of people. 5. I don't give a rats who wins next week. That's my year in football over. But wow, what a way to end it. It's not as if we didn't have plenty of notice. The newsletter came home weeks ago, advising us about the Writers' Festival, and the date of the Book Parade. -- So, who do you think you might dress up as? -- Which one is Leafpool, again? Is she the healer cat? -- Medicine cat. She's a brown tabby. -- Couldn't you be a grey cat? We have loads of grey clothes, that would be easy. You've got those grey tracksuit pants. -- No, Mum. Leafpool is brown. -- But couldn't you be a different cat? Aren't there any grey cats in Warriors? -- I don't want to be one of the grey cats! I want to be Leafpool! -- We should start thinking about your costume. Book Parade is next week. -- Yes, you need to buy me some brown tracksuit pants and a brown top. -- Well, I'd rather not buy new stuff if possible. Anyway, brown is out of fashion, it'll be hard to get... Why don't you be one of the grey cats? Or a wolf? You could wear your wolf hat. -- I'm sick of wearing my wolf hat. I want to be Leafpool from Warriors. -- But we don't have any brown clothes. Couldn't you be a human book character? Let's try and think of someone. Ramona? Laura Ingalls? Matilda? -- I hate Matilda. Maybe I could be Camilla, from Life in Outer Space. I like her, she's nice, she's cool. -- Oh, good. Be Camilla. Great. -- Book Parade is in two days, have you organised your costume yet? What does Camilla wear? -- I don't want to be Camilla any more. -- Oh, no!... I mean, really? Who do you want to be then? -- Let's get the dress-ups down from the attic and see if that gives us any ideas. -- No. Nothing here. None of these. -- A gypsy skirt? A white cat? A detective? -- No. I've decided. I definitely want to be Leafpool. -- But we don't have any brown clothes! It's too late to run around and buy stuff now! Why don't we we pretend that Leafpool is grey. -- No. I've told loads of people I'm going to be Leafpool, and Leafpool is brown. -- But no one else knows what colour the Warrior cats are! -- Sarah knows! Felix knows! 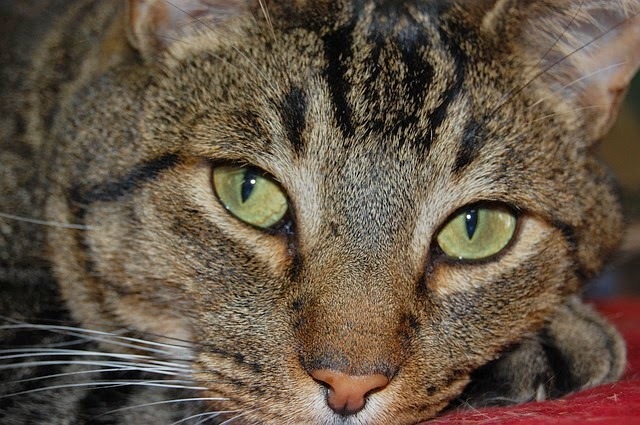 Leafpool is a BROWN TABBY. -- But you don't have anything brown... Okay, don't have a meltdown. I'll go to Savers today and look for brown clothes there. Oh! I just remembered! Look, here's my brown hoodie, you can borrow that. -- Thank you, Mum. And if there's nothing at Savers, we'll go to Northland. -- Hm. We'll see. I'd rather not. Let's see what's at Savers first. -- Okay, I found these lovely brown cord pants at Savers, the only brown kids pants in the whole of Savers. And this scarf, I can make that into a tail. And I spent all day cutting out bits of cardboard and gluing on scraps of brown cloth out the rag bag and trying to stick them to this headband, for ears. -- These pants are too small. I'm not going! I don't want to go, I never wanted to go, I'm not going! -- You have to go! You're giving a speech at the opening! And it's TOMORROW. -- I don't care, I'm not going! -- Here's my old brown skirt, why don't you wear that instead? -- Cats don't wear skirts! -- I don't care, I'm NOT GOING. -- Okay, get in the car, we're going to Northland. There are no brown pants at Best & Less. No brown pants at Target. No brown pants at KMart. No brown pants in the whole of Northland. -- When I grow up, I'm going to open a shop that has just brown clothes. -- What about people who like brown? There must be brown somewhere. -- If there were any brown clothes, we would have found them by now. -- Excuse me, do you have any brown clothes? -- Okay, I guess I'll have to wear the skirt. With white leggings and white socks, because Leafpool has white paws. -- Okay. Here's your tail, I've sewn up that scarf for you. -- School starts in half an hour! I don't have time for this! There's the doorbell, your friend is here. The friend has dressed as... a school girl. Shirt, tie, skirt, tights. Simple. They go off to the parade together, chatting.